The Chimney NYC is pleased to present Incantations: The Modern Cave, a group exhibition exploring the trace: human, natural or industrial. The ones left by our species as a testimony of our passage on earth, those created by artists sharing their vision of the world, and others oscillating between natural and man-made, organic and manufactured. The exhibition explores the primal desire of contemporary artists to create in this geological era commonly referred as the age of the Anthropocene. The red industrial bricks, blocked cemented windows, metal beams and condemned chimney make of The Chimney a Modern Cave. Six artists working across various medium have left their own trace. Incantations: The Modern Cave both reveals and resolves the inherent conflict of an increasing industrial landscape in which nature strives to survive. Juliette Dumas directly investigates the interrelationship between the natural and human realm. In her Frozen Plates series, she pours wheat paste, ink and varnish on metal plates on days where temperature drops. Collaborating with the cold, Dumas captures the invisible marks of its ghostly presence and reveals the unseen to the eye. Her work both questions the inevitable environmental degradation and humans’ attempt to control it. 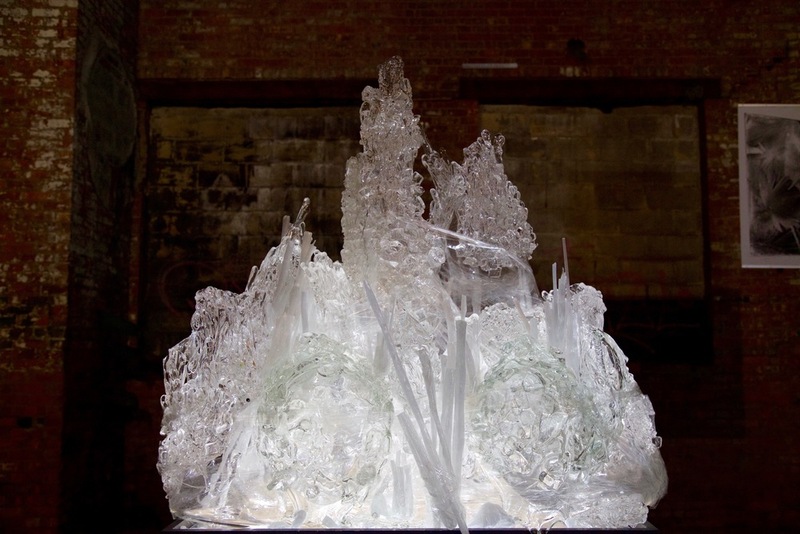 Andrew Erdos’ Mountain glass sculpture comes together to form spiking mountaintops that represent his investigation of the complex relationship between humankind and its environment. Inspired by Shiprock, the sacred mountain in the Navajo Nation, Erdos intends to build a monumental version of the piece and to install it in the desert with Shiprock as its background. This will be a time based piece, and viewers will watch the sculpture gradually wear away to the natural forces of wind, water and erosion over years, either experiencing it in person or watching the process as it is streamed live from multiple cameras placed in its surroundings. Riitta Ikonen’s work threads memory, myth, imagination and a utopian view of the natural world. As expressed by Robert Smithson in “A Sedimentation of the Mind”, Ikonen explores “abstract geology”, that is the geography of the mind through performance, sculptures, wearable objects, and videos. With growing organic vegetation colonizing the walls of the space, Ikonen reconciles the raw architecture of The Chimney with nature. In her paintings, Gwendolyn Kerber attempts to capture the ever-changing nature of landscape in an ecology of color and marks. While exploring the spatial, philosophical and abstract qualities of natural environments she reveals the uttermost beauty of both paint and nature. Her oil paintings on boards and scraps on canvas appear to hover on the walls of The Chimney like small apparitions. Over a period of three months, Dylan Gauthier produced a series of public boat trips through urban space on neighboring Newtown Creek. During those excursions, he invited artists, writers and scholars working on ecological themes to explore the edges and surface of the creek while interviewing them on their practice and the role of the artist in the Anthropocene. For the exhibition, Gauthier will bring the creek into the Chimney as sound and data, including as a sound piece compositing some of these interviews with live and field recorded sounds. These will be played back to the creek itself through custom fabricated underwater speakers. Aaron Taylor Kuffner turns an Indonesian object of antiquity, the gong, into robotic sound producing sculptures, and re-contextualizes the archaic ritual tradition to envelop the audience. Kuffner's work exposes the viewers to the rich and profound nature of musical resonance and its effect on the body and the psyche. The Sonic Sculpture's contrasting materials and mechanisms tell us a story of globalization and modernization. Ultimately, the works presented in Incantations: The Modern Cave are tied by what Georges Bataille refers as a form of transcendental experience explored by artists in their creation process: “to create a sensible reality whereby the ordinary world is modified in response to the desire for the extraordinary, for the marvelous”. Juliette Dumas (b.1987, Paris, France) completed her BA at Villa Arson in Nice France and MFA at School of the Art Institute of Chicago (SAIC) in 2013. Her paintings, photographs, sculptures and ephemeral installations investigate human’s relationship to the environment and the tension between man-made and natural elements. Dumas has been awarded artist residencies at Festival Grandeur Nature, Ristolas, France in 2009 and La Station, Nice in 2015. She was nominated for Clare Rosen & Samuel Edes Foundation Prize for Emerging Artists by the Painting and Drawing Department of the School of the Art Institute of Chicago. Dumas' work was featured in notable solo and group exhibitions including “Winter Studies” (2015), Kunstverein Gaestezimmer E.V, Stuttgart, Germany (Curated by Alf Setzer); “New York” (2013), Hawkeye Crates, Brooklyn, NY; “Ad Hoc”(2015), La Station, Nice, France; “Waterline: Inspiration for Change” (2015), Studio C Gallery, Los Angeles; “No Grand Rituals” (2014) and “The Rock Show” (2014), Hawkeye Crates, Brooklyn, NY; “Mono no Aware Film Festival” (2013), LightSpace Studios, Brooklyn, NY; “Clothes Line” (2012), Lawn Gallery, Chicago, IL; “Atelier Nomade” (2009), French Ambassy, New York. She lives and works in New York. Andrew Erdos, (b. 1985, Norwalk, CT) graduated with a BFA from Alfred University. He has been the subject of solo exhibitions at Claire Oliver Gallery in New York, with Invaluable (2015) and Guaranteed Impermanence (2013), and “Slow Motion Castrophy” at The Chimney NYC, New York. The youngest recipient of the Rakow Commission of the Corning Museum of Glass, his work has been exhibited worldwide and throughout the United States. Notable group exhibitions include “Piece by Piece” at the Kemper Art Museum, Kansas City (2015); “Glass Today: 21st Century Innovations” at the New Britain Museum of American Art (2014); “Facets of Modern and Contemporary Glass” at the Knoxville Museum of Art (2014); “Color Ignited: Glass 1962-2012” at the Toledo Museum of Art (2012); “Cyberfest” at The State Hermitage Museum in St Petersburg (2009), “Art Parade” at Deitch Projects in New York (2008), and “Insatiable Streams” at Beijing BS1 Contemporary Art Center in Beijing (2007). Dylan Gauthier (b. 1979, Santa Monica, CA) is a Brooklyn-based artist, curator, and writer who works through a deeply engaged artistic practice centered around ideas of ecology, architecture, image-objects, and the social. His work has been shown at the Parrish Art Museum, ISCP, Carpenter Center for the Visual Arts at Harvard University, EFA Project Space, MoMA PS1, MASS MoCA, the Walker Art Center, the Bronx Museum, Stacion Center for Contemporary Art Prishtina, Parsons, Columbus College of Art and Design, 80WSE Gallery at NYU, and SUNY Purchase. In 2016 he is a Socrates Sculpture Park Emerging Artist Fellow and the inaugural Artist-in-Residence at the Brandywine River Museum and Conservancy in PA. In 2015 he was awarded the NEA supported Ecological Artist Residency at the International Studio and Curatorial Program (ISCP). Gauthier studied French Literature, Linguistics, and Studio Art at the Sorbonne Nouvelle, Paris III, and holds an MFA in Integrated Media Arts from Hunter College (‘12). Gwendolyn Kerber (b.1953, Cleveland, OH) hold an M.F.A. in painting from Yale University, a B.F.A. from the Cleveland Institute of Art and a B.A. from Hampshire College. In 2013 she was a Pollock-Krasner Foundation grant recipient. Kerber has also received several awards and residencies, including The Berlin Collective Artist Residency Program at the APT studios in Brooklyn (2014), the Vermont Studio Center (2013), The Dagaocun Artist in Residency Programme in Beijing (2008) and The Skowhegan School of Painting and Sculpture (1979). Kerber’s work has been featured in numerous solo and group exhibitions including “Standing in Water” (2015), Tête, Berlin, Germany; “Something Glimpsed Head-On” (2015), 849 Gallery at KyCAD at Spalding University, Louisville, KY; “Shifting Ecologies” (2014), The Painting Center, New York, NY; “48 Stunden-Neukölln” (2014), Berlin, Germany; “Parting Gifts: Artists Honor Bruce Katsiff, Director/CEO 1989-2012” (2012), The James A. Michener Art Museum, Doylestown, PA; “Natural Constructed Spaces” (2012), The Painting Center, New York, NY; “2008 Beijing International Art Biennale” (2008), China National Art Gallery, Beijing, China; “Verkehrte Natur” (2006), Kunstraum t27, Berlin, Germany. She lives and works in Berlin and Newtown, Pennsylvania. Aaron Taylor Kuffner (b. 1975, New York, NY) has performed or presented work more than 400 times in 20 countries in the last seventeen years. Kuffner exhibits with Sundaram Tagore Galleries in New York, Singapore, Hong Kong and International Art Fairs. He has shown at the 56th Venice Biennale at the Palazzo Grimani Museum in Venice, the Hudson Valley Center for Contemporary Art, The Sackler gallery at the Smithsonian Institute, The Clocktower Gallery, and The Drawing Center, with a forthcoming exhibition at The Nelson-Atkins Museum of Art. Kuffner and his various projects have notably received grants, in-kind support and awards from: The Andy Warhol Foundation for the Visual Arts in association with the Clocktower Gallery, The Trust for Mutual Understanding, The Experimental Television Center, The New York Council for the Arts, Ableton Gmhb, The CEC Artslink, Scope Arts, Artist Wanted, Techshop, The New Orleans Airlift, The Indonesian Foreign Ministry, The Dharmasiswa Scholarship, The Berlin Arts Council, The European Commission, I-D Media Berlin, Schloss Brollin Art Labor, The James F. Robison Foundation, The Soros Foundation, Swiss Air, The Mid Atlantic Arts Foundation and The US Artists International partnership with the National Endowment for the Arts and the Andrew W. Mellon Foundation.